Face swap apps are a huge part of the humorous side of the internet. People love showing the hilarious, weird and sometimes even horrifying results that such apps create. But not everyone can use these applications, so other people come to the rescue. 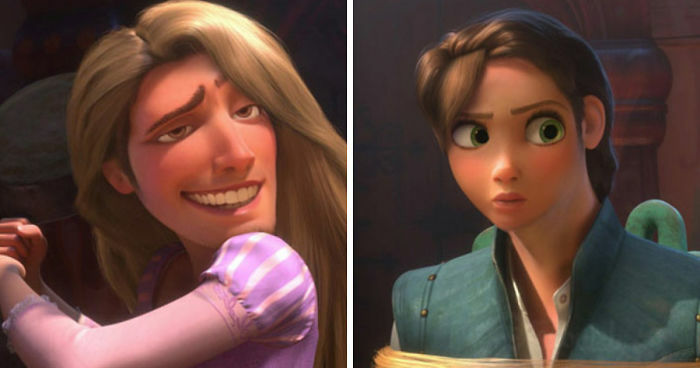 Disney Face Swap page collects images of Disney characters with swapped faces. Some of the images look funny, some - unsettling, and in some it's even hard to find what was changed. Take a look at some of the best images that show what would happen if Disney characters used face swap apps. Is it just me or does Ursula look like Phyllis from The Office? Witch: You gotta try harder to become a Greek God! Looks like a Coraline character! "Wish I could be part of tha- never mind then"
Don't stare down there, don't stare down there, don't stare down there. John honestly looks the same. Maybe I just haven't seen the film in a while..
this is truely a work of ....art? Omg the bird "girl shut up..."
TREASURE PLANET! Best Disney film! A rare photo from Nigel Thornberry's Childhood. Prince Eric's thoughts - Oh man, why is their finger so cold and in my ear? When somebody walks front of her, rage is real! Belle's new face suits this situation - Ew, hands off buddy!